A 38 year old American novelist discovers the difficulties of being married to a British 16 year old schoolgirl. 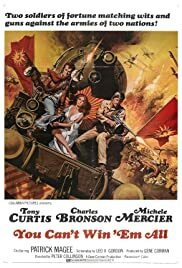 Set against the backdrop of the Greco-Turkish War (1919–1922) Soldiers of Fortune tells the story of two opportunist former U.S. Army soldiers Adam Dyer(Tony Curtis) and Josh Corey (Charles Bronson). The two joins a group of Turkish mercenaries to protect the daughters of an Ottoman sultan and a train that carries gold. This is the first movie in cinematic history that portrays Mustafa Kemal Atatürk (even briefly by Patrick Magee) who is the founder and the first president of modern Turkey. Believe it or not, the rumor has it that one of the Turkish journalists wanted to interview Charles Bronson after the production of the movie but he was just vehemently rejected by Bronson. So the embittered journalist just started a smear campaign against the movie, that's why the movie has never been available on DVD here and unfortunately the only way that you can watch this movie in Turkey is to get hold of a pirate VHS copy. You Can't Win 'Em All may not have sounded realistic or historically accurate but it would not be fair at all to expect complete historical accuracy from an adventurous western movie. The filming locations do not really follow a logical order either. For instance, the mercenaries set out their adventurous odyssey in İzmir (formerly Smyrna)At first they camp in the Cappadocia region (east-central Turkey) Later on you see them in Ephesus and Didim (which is at the far west)I guess Peter Collinson must have thought he should show a few places that a tourist must see in his/her visit to Turkey. You Can't Win 'Em All may not be the best movie but if you like westerns and if you are real fans of Curtis and Bronson there is not a reason why you shouldn't like this one.